← Enhance your teaching with Open Educational Resources… And earn badges, too! Quizlet.com is a free website which enables teachers and students to create digital flash cards. That’s not where the magic stops, however. Quizlet can automatically generate interactive games and even tests of the material you enter into it. Five or ten minutes of typing (or pasting!) up front can yield literally hours’ worth of automatically-assessed activities inside and outside of the classroom, on computers, smartphones, tablets, and even pencil-and-paper printed exercises. Interested? Read on! How do I make a set of flash cards for my students? Now that we’ve covered the basics, here are eleven specific ways in which Quizlet can help your students robustly acquire and remember class material. Because I am a language teacher, I will focus on vocabulary, but the same principles can apply to most subjects. 1. Quizlet reads the word and definition to the student out loud, enhancing students’ grasp of pronunciation. Quizlet has text-to-speech capabilities in eighteen languages as of 2013, and more are on the way. Granted, the pronunciation is not always perfect or unambiguous—for example, some English words like “conduct” have both noun and verb forms which are pronounced with different syllable stress patterns, and Quizlet would haven no way of knowing which part of speech to pronounce unless the word is used in a sentence—but as a general studying aid, this feature is invaluable. 2. 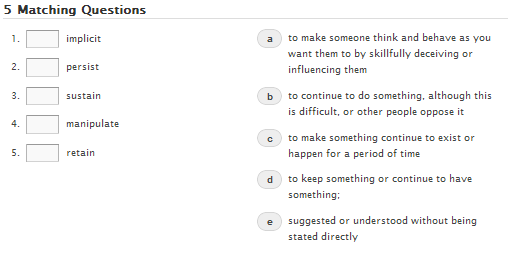 Quizlet provides targeted spelling feedback. In the “Speller” studying mode, students hear the target word spoken out loud and see a written definition on the screen. Their task is to type the target word using its correct spelling. If they make mistakes, Quizlet visually corrects the error, re-reads the word, and reads the spelling one letter at a time. For students who particularly struggle with spelling, such as Arabic-speaking learners of English (Martin, 2011), this specific, multi-modal feedback is a wonderful resource. 3. Quizlet provides adaptive training to help students focus on the items most difficult for them. In the “Learn” mode, Quizlet tests students one item at a time. The items a student performs more poorly on are brought back for further review to help students focus their efforts on items which they have not yet learned or which are more difficult to remember. This adaptive training method increases the efficiency and effectiveness of students’ studying. 4. Quizlet generates customizable randomized tests for your students to boost their long-term memory. Quizlet can generate tests involving written, matching, multiple choice, or true/false questions, or any combination thereof. The tests may be taken on a computer or smartphone and automatically graded, or they may be printed out and distributed in class. This is useful for students’ self-assessment, but the actual learning benefits of this activity cannot be overstated. Self-testing is critical in building robust long-term memory of learned materials (Karpicke & Roediger, 2008), so the more your students test themselves, the better their performance will be in the future. 6. Quizlet can be used at home or on the go. As long as students have links to your course materials on Quizlet’s website, they can study independently at home or else use Quizlet’s excellent, full-featured mobile website or free iOS app to study on the go. You can link to or embed Quizlet on your class’s content management system or blog, or using QR codes, you can embed Quizlet practice links on your paper handouts for students to scan with a smartphone or tablet. Try it out: Scan the QR code immediately below this paragraph using your smartphone or tablet and you’ll be directed to the mobile Quizlet site shown below! 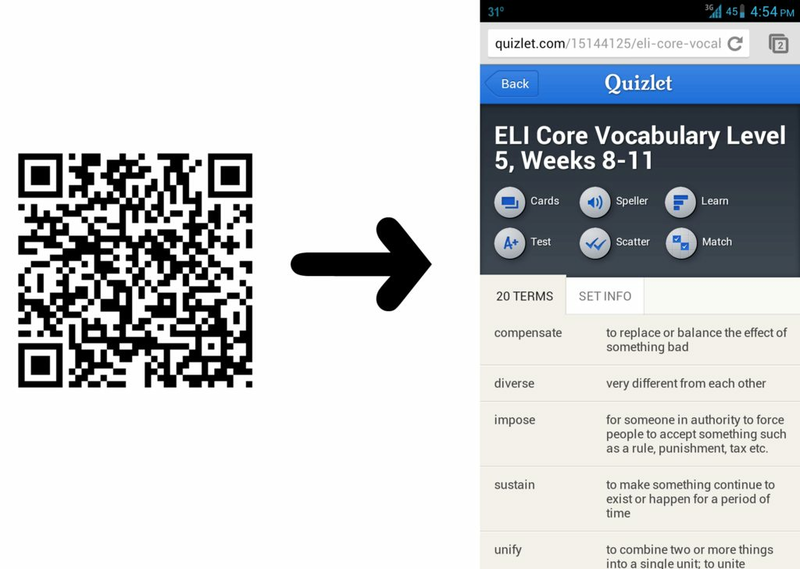 By adding similar QR codes to your paper handouts in class, you can provide students with concrete links to supplemental digital studying materials they can use between classes, on the bus, or whenever else they have a spare moment. Glossary: terms and definitions side by side — good for cramming lots of info in your pocket. Table: terms and definitions in a table — great for studying line-by-line with a covering piece of paper moving down the page. Small: 10 flashcards per page. Large: 5 flashcards per page. 3×5 Index Card: double-sided index cards. 8. Your students can export or mix and match different card sets together to create a personalized deck. One of the most underappreciated features of Quizlet is that anyone can create a hybrid deck of cards by copying other people’s decks, combining multiple different sets together, throwing out unwanted cards, and perhaps adding new extra cards manually. Promote your students’ agency and help them become responsible for their own learning by encouraging them to customize their studying materials using these versatile mix-and-match material aggregation features. 9. You can create a “class” for your students on Quizlet and even track their progress if you choose to do so. Personally, I view Quizlet as being purely automated formative assessment: I don’t keep track of my students or grade them in any way based on their Quizlet studying. However, features for creating a class and tracking student progress do exist for teachers who wish to integrate Quizlet more fully into their curriculum. 10. Once your students become familiar with Quizlet.com, they can discover millions of other user-created flashcards. It’s easy to find flash card sets of just about any subject material imaginable. Of course, it can be difficult to monitor quality and accuracy with an open, user-curated resource like Quizlet.com, but it’s highly unlikely any given cardset will be intentionally or maliciously flawed; mistakes, if present, will tend to be small. For highly standardized or regimented types of material, such as the symbols of the chemical elements or definitions of common SAT words, accuracy can reasonably be assumed. 11. 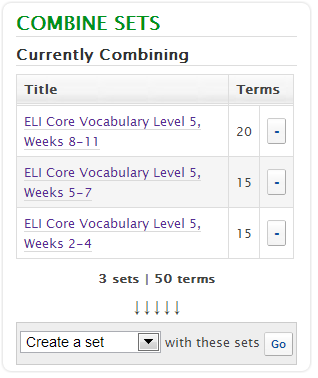 Students can export Quizlet card sets and use them with other programs or websites. Although I enjoy many of the features of Quizlet.com both as a teacher and a learner, I prefer to use Mnemosyne, a spaced repetition flashcard program, to test myself on foreign language vocabulary over long periods of time. Luckily, it is simple to export a Quizlet.com set into a format which other websites or computer programs can read. The export format can be configured in several different ways to ensure compatibility with your target website or program, so you never get “locked in” to Quizlet.com. 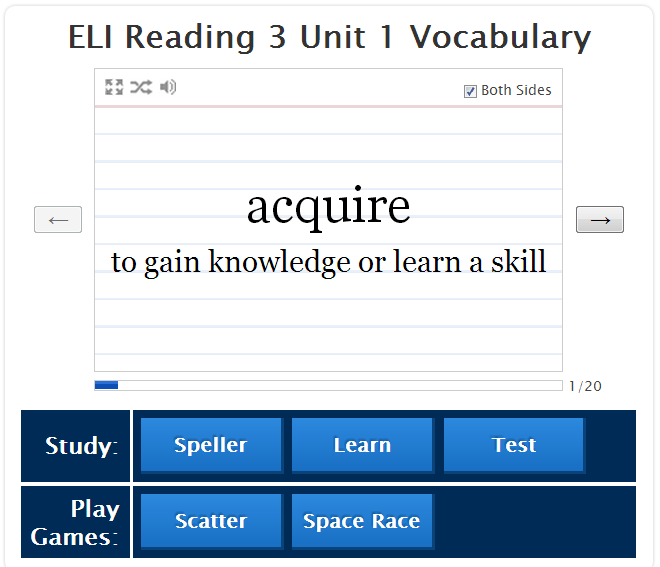 For example, here is the export page for an ESL vocabulary flash card set. Have you ever used Quizlet.com or another online flash card website in your class? How did it go? What other uses or tips do you know of? Sound off in the comments! Martin, K. I. (2011). Reading in English: a comparison of native Arabic and native English speakers. Master’s Thesis, University of Pittsburgh. I enjoyed your post on teaching with Quizlet. I teach EFL at Asia University in Tokyo and have been trying to incorporate mobile technology into my students’ learning for years. Anki and Quizlet have a lot of potential, but the real trick is getting the students to use it consistently. I have a modest blog at teachingwithsmartphones.blogspot.com if you’d care to check it out or comment. Thanks for the note, Rich! Spaced repetition rehearsal software like Anki is really the golden standard for promoting long-term retrievability of paired-associate items in memory. I enjoy Quizlet because it’s more accessible and (as noted in this article) has a robust “export” functionality which lets you move card sets into spaced repetition software if you wish to do so. Good luck over there in Tokyo! I’ll follow your blog. Nice overview of the Quizlet functions. I just gave a presentation on it myself, and how you can export data from the http://www.readlang.com site to use in it. Many thanks for the tips. Planning to embed quizzes on the LMS we use at our school. Didn’t know about importing from MS. Big ups. Very useful tool! Enjoyed presentation good deal. Until this presentation, had no clue what QR codes (the term, at any rate) or how I can use them w/ Quizlet. Cannot wait to use more of this w/ French, German and Russian. Pingback: Tangled Up in Christmas Lights – Have You Tried Turning Off and On Again?